Compilation of Srila Prabhupada speaking about the nectar of chanting Hare Krishna. By studying Srila Prabhupada's instructions on this most important of subjects, we will become fully convinced of the central importance of offenseless chanting of the Holy name of Krishna in our endeavor for spiritual advancement. Format: spiral bound, 9" x 7"
On June 7, 1977 I wrote Srila Prabhupada a long letter. I felt an urgent need to write to him because I wanted to propose an idea that had occurred to me while contemplating the possibility that he might leave us before long. The obvious and compelling question was, "In what form will my relationship with Srila Prabhupada continue after his physical departure?" Taking shelter of sastra, I found this statement in Srila Prabhupada's commentary to Srimad-Bhagavatam 4.28.47: "... The disciple and spiritual master are never separated, because the spiritual master always keeps company with the disciple as long as the disciple follows strictly the instructions of the spiritual master. This is called the association of vani (words). Physical presence is called vapuh. As long as the spiritual master is physically present, the disciple should serve the physical body of the spiritual master, and when the spiritual master is no longer physically existing, the disciple should serve the instructions of the spiritual master." I could understand, therefore, that if I were to always very seriously attend to his instructions, I would always be able to feel enlivened by Srila Prabhupada's transcendental presence within my heart. Now, where are those instructions? Those instructions are enshrined primarily within his books. As Srila Prabhupada stated upon his return to Vrindavan from London, shortly before his physical departure, "The sayre is nothing new to be said. Whatever I had to say, I have already said in my books. Now you must all try to understand it and continue with your endeavours." It therefore seemed natural to compile the teachings of Srila Prabhupada on different topics. 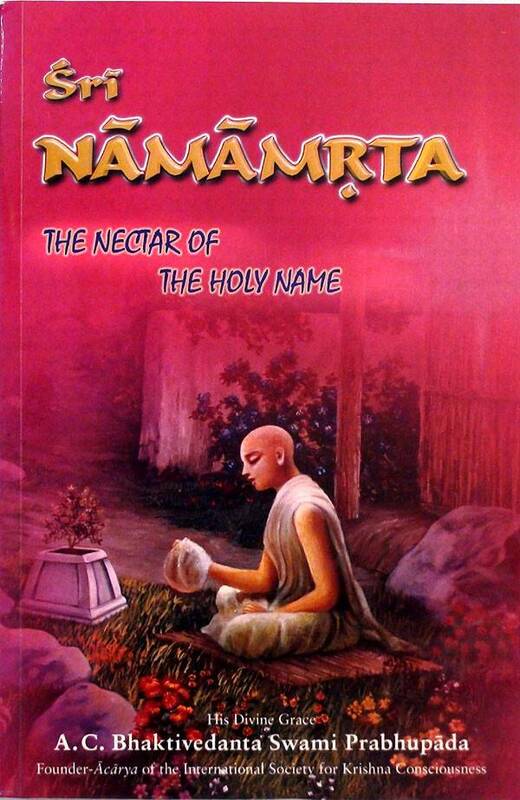 It seemed natural to produce a compilation of Srila Prabhupada's teachings on "The Nectar of the Holy Name" because the chanting of the Hare Krishna maha-mantrais the foundation of our practice of Krishna consciousness. All of us should absorb our minds in these nectarean instructions with rapt attention and conscientiously apply their conclusions in our practical spiritual life. By studying Srila Prabhupada's instructions on this most important of subjects, we will become fully convinced of the central importance of the offensless chanting of the holy name of Krishna in our endeavor for spiritual advancement.